An Event Report lets you track the identification, investigation, and resolution of any issues affecting your operation. The Event Report feature of the MMIR system can be an important element of your company's Quality Assurance (QA) program, Continuing Analysis And Surveillance System (CASS), reliability program, or Safety Management System. For more information about safety risk management, consult the U.S. FAA's Office of System Safety website. An Event Report's status can be New, Open, Closed, or Rescinded. When an Event Report is initiated, its status is New. Once acknowledged by the designated management representative (via checkbox), the report's status is Open. An Open report means that an issue has been identified, brought to management's attention, and needs to be addressed. Authorized users can enter additional comments on Open reports as an investigation ensues. Once the issue has been satisfactorily resolved and documented, the Event Report should be classified as Closed. Once Closed, no further entries or amendments are possible on the Event Report. Authorized users may also rescind a New or Open Event Report, but this option should be used sparingly. Rescinding an Event Report effectively nullifies the report without resolution. The report remains stored in your company's account for reference purposes. Refer to User Levels to determine the capabilities of authorized users. Event Reports are INTERNAL TO YOUR COMPANY unless specifically designated to be SHARED. 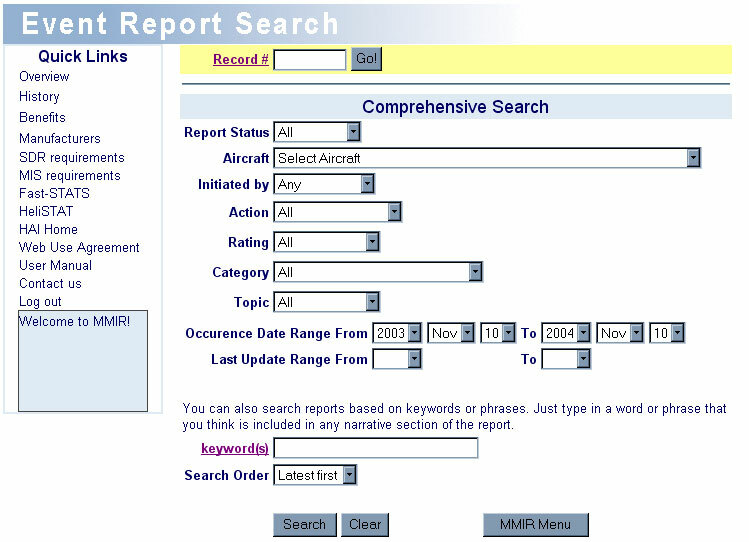 Unlike MMIR reports that you send to the FAA or the part manufacturer, your Event Reports are ONLY ACCESSIBLE TO AUTHORIZED COMPANY EMPLOYEES, unless designated as SHARED. The information in an Event Report can easily be copied to a MMIR form, if deemed appropriate. For example, after an Event Report is filed, it may be determined that a defective part was at fault. 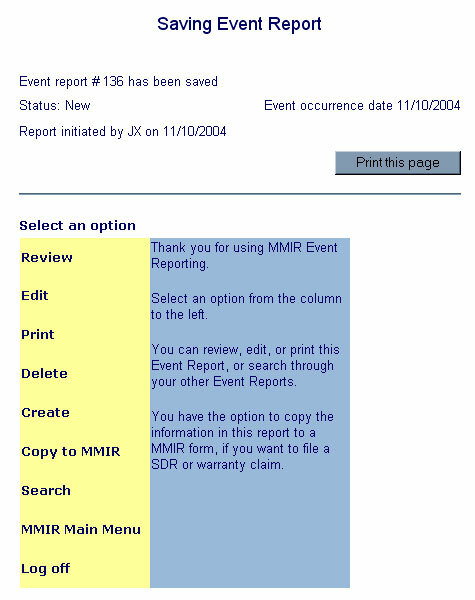 You have the option to transfer information from the Event Report to a MMIR form, allowing for quick submission of a warranty claim, SDR, or MIS. The Event Report stays permanently in your account. From the Main Menu, select "New Event Report"
The Event Report form is structured to let you assign general categories pertaining to subject and urgency of resolution. You can also designate the time of the event occurrence, and if applicable, the specific aircraft and/or engine. The important point to remember is to USE THE FORM AS YOU SEE FIT. Unlike SDR or warranty claim forms, there are no required fields on the Event Report form. Just provide enough information to help with your operation. Read allows the user to view existing Event Reports only. This is the lowest level of authorization. Write authorizes the user to initiate a ("New") report and edit (add information and comments) existing company reports. This is an appropriate level for employees who have reason to report and/or comment on problems or observations. Manager controls the dispensation of Event Reports. This level acknowledges "New" Event Reports, changing the report's status to "Open." Without Manager-level acknowledgement, an Event Report remains in "New" status indefinitely. "Acknowledgement" means that the company's manager or management representative has read the Event Report and intends to research the issue. The Manager also "closes" the acknowledged report. The Event Report should be closed once the issue has been satisfactorily resolved and documented. Once closed, no futher entries or amendments are possible on the Event Report. The Manager also has the option to " rescind" a New or Open Event Report. Rescinding an Event Report effectively nullifies the report without resolution. The report remains stored in your company's account for reference purposes. Administrator controls other users' levels of authorization, and adds or removes users from the system. The Administrator also enables and disables Anonymous Event Reporting, including establishing the Anonymous Report password. Anonymous users, described next, have limited authority, and can only initiate Event Reports. This is not a User Level, but an option that allows non-registrants to submit Event Reports. There is growing understanding that to encourage the reporting of problem areas and safety-related issues by all employees, a business climate must exist in which identifying and correcting problems takes precedence over assigning fault and metering punishment. To work towards that goal of a "Just Culture," Event Reporting provides the option for users to submit Event Report anonymously. It is up to management to decide whether or not to utilize this feature, or whether to continue it. To allow anonymous reporting, the MMIR Account Administrator must select that option on the Registration form. ("Edit Users" link on the Main Menu) Also, a password must be selected (at least 8 alphanumeric characters). This password should be different from any user's MMIR password. Once Anonymous Reporting is enabled, a Company ID will be assigned automatically. The Company ID is provided via the "Print Instructions" link. This Company ID and the password should be made available to all company employees, and not revealed outside the company. When someone initiates an Event Report, its status is New. The report remains in New status until a Manager reviews the report and checks the "Click here to acknowledge this report" box (just beneath the large Describe Event text box). Once the report is acknowledged, its status changes to Open. Authorized users (those with access to your company's account and assigned an appropriate User Level; i.e., Additional Users) can log on to MMIR anytime and review or add details to the Event Report. ANYONE WHO ACCESSES OR EDITS AN EVENT REPORT HAS THEIR INITIALS ASSIGNED TO THAT REPORT. By tracking who has accessed an Event Report, accountability is provided. This accountability trail is listed under the "History" section, including dates and times. EXCEPTION: Anonymous Users are only identified as "Anonymous." Probably the most important features of the Event Report form are the 3 text boxes: Describe Event, Investigations & Findings, and Resolution. Here, authorized users describe in their own words what happened, keep track of findings as an investigation progresses, and document the resolution for future reference. An Event Report can be accessed and edite by authorized company users indefinitely, until the report is Closed or Rescinded. Closed An Event Report is designated as Closed by a Manager (via the checkbox at the bottom of the form) when the issue has been satisfactorily resolved and documented. Remember, someone in your company may review this form years later, so make the report detailed enough to be helpful. After checking the Closed box, you will be reminded to notify the initiator of the Event Report, and you can specify the date on which the report was closed. Also, you will be given the option to "share" your Event Report; i.e., make it available to external parties. Once Closed, the Report is reviewable, but no longer editable. Rescinded A Manager User Level may also rescind a New or Open Event Report, but this option should be used sparingly. Rescinding an Event Report effectively nullifies the report without resolution. The report remains stored in your company's account for reference purposes. Summarizing, you Close an Event Report when the issue has been resolved and documented. You may Rescind an Event Report if you believe the underlying issue did not warrant an Event Report. Only users with Manager User Level can Acknowledge, Close, or Rescind an Event Report. This is the menu you will see after you Save your Event Report. 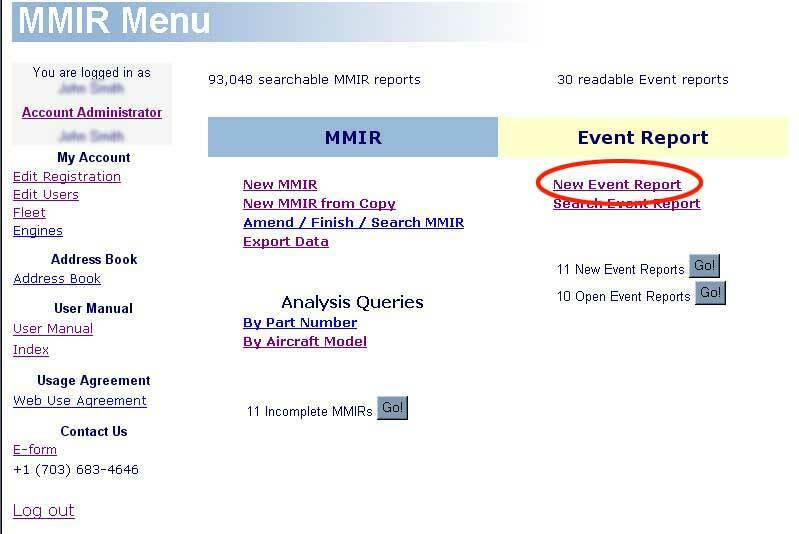 You can review it, edit it, print it out, create a new Event Report, search for existing Event Reports, go to the MMIR Main Menu, copy the data from the Event Report to a MMIR form, or log off MMIR. IF YOU HAVE JUST INITIATED A REPORT, you have the option, just this time, to delete it. THIS IS THE ONLY TIME YOU CAN ACTUALLY DELETE AN EVENT REPORT; i.e., immediately after starting it. The next time any authorized user (including the initiator) accesses this report, the Delete option will be unavailable. Remember, an Event Report "goes nowhere" unless you specifically designate it as "Shared" when you close it. 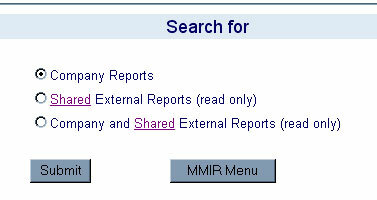 If the Event Report is not shared, only authorized users on your company's MMIR account have access to it. If you know the record number, just enter it in the Record # box at the top and click the Go! button. Otherwise, search on any or all fields under the Comprehensive Search banner. The date range defaults to the past year, but change that to your preference. Another helpful feature is the keyword search. Let's say you remember something you wrote in one of the text fields, such as Investigation & Findings: "The pilot reported a click clack noise on shutdown." To quickly find the report, you could type a clause as you remember it; e.g., click clack. A list would appear that includes all Event Reports with that text IN ANY OF THE 3 TEXT NARRATIVE FIELDS. What is the advantage of sharing your company's information? Obviously, you will have to make that determination when you Close your Event Report. You will be given the opportunity to designate the report for sharing with others. This means that external parties, even your competitors, will be able to review that specific Report, unaltered and in full.
! Tip While anyone may view a Shared Event Report, no one can amend or edit it. HAI believes safety is enhanced when information is shared. A documented problem and its resolution could be helpful to other operators who might be experiencing similar issues, or make them aware of potential trouble. HAI recommends sharing information whenever competitive interests are not infringed. Who knows...someone else's shared Event Report may help you one day.